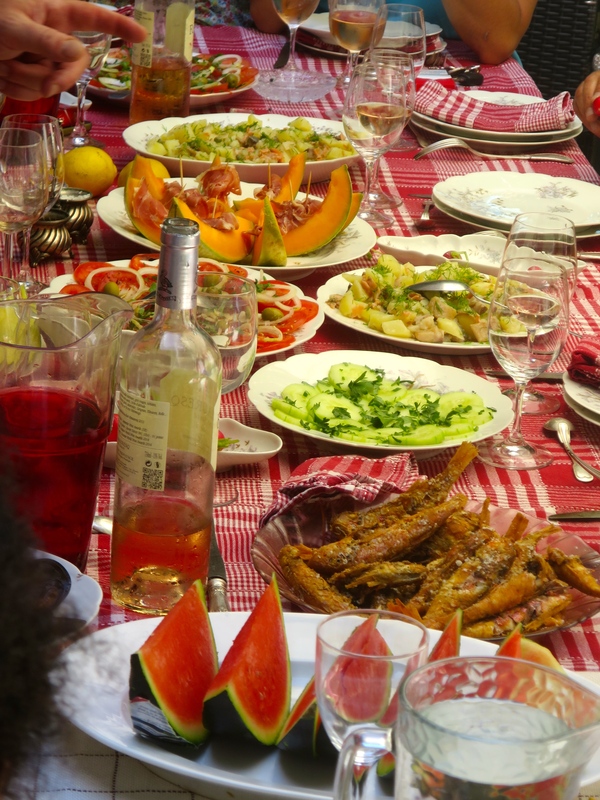 This web log is about wine, but this week we include two recipes. Why? Because recipes keep pouring in after my request for them for a forthcoming book – Winemaker’s Cooking Companion. Isabelle Chéty of Château Mercier informed me of her mother – Martine’s – trove of vineyard recipes on their website recipe page (including – harvest cod, ribeye steak cooked over vine shoots, and Côtes de Bourg ratatouille), while winemaker Thomas Marchand contributed his great-great-grandmother’s recipe for pan-fried foie gras with basmati rice – originally from the wine region of Cahors. As an American I’m woefully ignorant about the sport – but at the wine store ‘La Cave de la Citadelle’ in Blaye was recently introduced to renowned Australian cricketer Dennis Lillee and his wife Helen. They were visiting the region, and kindly offered to put me in touch with Australian winemaker friends who can provide some more valued recipes. This week includes two recipes appropriate for the upcoming harvest (yes, it’s still a few weeks away): fried eggplant (aubergine), and ratatouille. 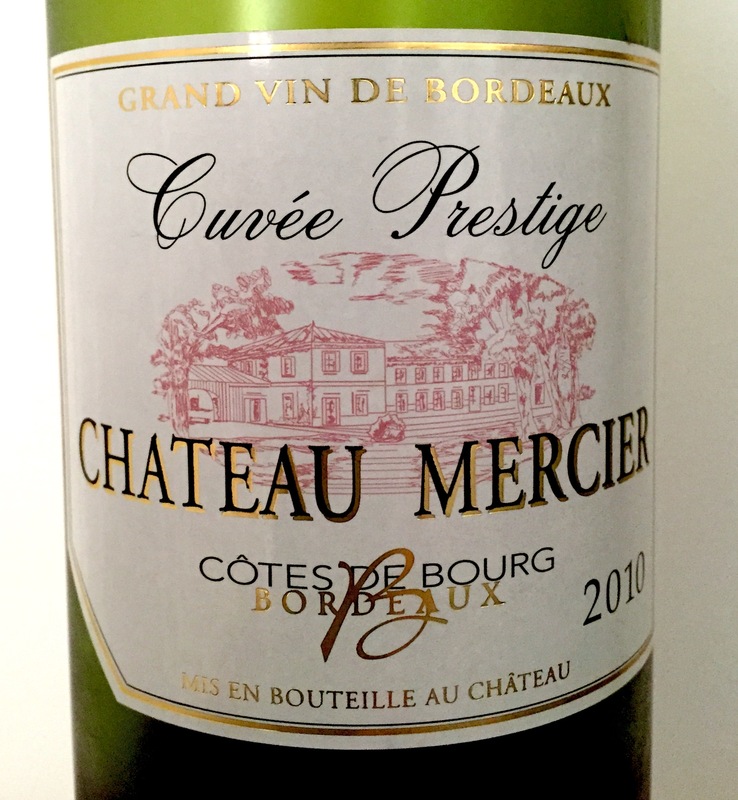 Both come from Martine Chéty, who lives with her winemaker family in the beautiful rolling hills of Bourg, about 20 minutes away from Blaye (or 10 minutes, if you drive like her daughter Isabelle). I plan to cook all recipes that will included in the upcoming book – so managed to rally up a pan of ratatouille yesterday evening. My effort was far from splendid. After sautéing onions, I neglected to turn down heat after adding peppers and garlic. The result? A bit of burnage…a cardinal sin of cookery. Still, the final product was decent, though a bit mushy – likely because I winced at the sight of bare veggies in a pan, and – panicked – threw in a glass of water. Not a brilliant move. No harm….live and learn. Martine Chéty may have prepared this recipe years ago, because she recommends enjoying the ratatouille with a glass of Château Mercier Cuvée Traditional 1995. Good luck rustling up a bottle of that liquid gold. Instead I drank their Cuvée Prestige 2010 (even scoring that bottle required having an inside track). But a decent bottle of red – Bordeaux or some Cabernet or Merlot (or preferably a blend of both) – will do fine. These recipes comes from the 13th generation of a family that has lived on the same land, and has produced wine, since the year 1697. That’s more than a century before explorers Lewis and Clark hiked and canoed across the American continent while shooting buffalo and fishing wild salmon to eat. It’s the same year Saint Paul’s Cathedral was consecrated in London, the same year the first steam engine was patented, and the year Peter the Great broke Russia’s isolation by touring western Europe. 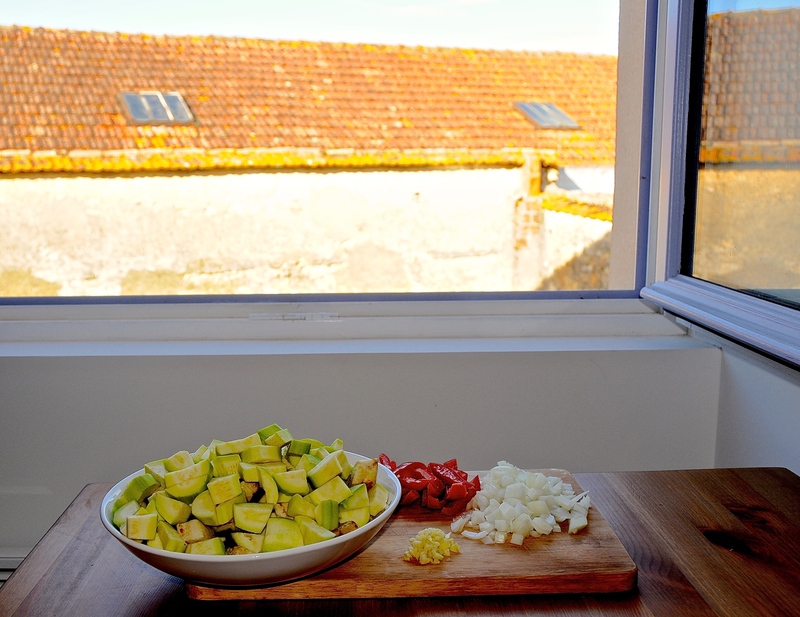 Côtes de Bourg Ratatouille – from Martine Chéty of Château Mercier. 45 minutes to prepare, 1 hour to cook. Serves 6 people. 1. Prepare the veggies – chop the onions and garlic, slice the peppers into long pieces a half-inch (1 cm) wide. Peel and chop the zucchini and eggplant into small chunks. Put aside. 2. Peel the tomatoes by plunging them into boiling water for 30 seconds, removing, then putting them into ice water to cool them before peeling (put three or four into the boiling water at a time). Then seed the tomatoes by slicing each in half along its ‘equator line’ and then scooping out the seeds with a spoon. Now chop them into chunks. Put aside. 3. Sauté onions in olive oil until they are lightly browned. 4. Reduce heat. Add sliced peppers and chopped garlic. Cook for 10 minutes. 5. Add zucchini and eggplant. 6. After 5 minutes add chopped tomatoes. 7. Add salt, pepper, parsley thyme, and sage. 9. Cook for an hour over medium heat, stirring occasionally, and adding spices/salt/pepper as needed from tasting. 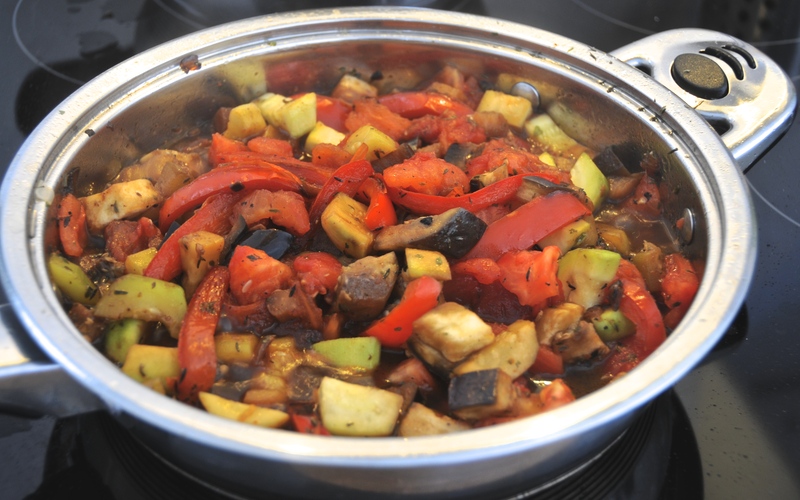 This ratatouille goes well with white meats, and with a decent bottle of red Bordeaux wine, or a Merlot. Fried Eggplant (Aubergine) – from Martine Chéty of Château Mercier. 30 minutes to prepare, 5 minutes to cook. Serves 4 people. 1. Prepare the veggies – peel the eggplants and then slice along axis into strips about 1/2 inch (1 cm) thick. Put strips in oven with medium heat for 5 minutes to dry them. Remove, then cut into large cubes. 2. Chop parsley until it is very fine. Crush or chop garlic. 3. Cover a pan bottom with olive oil. Add the eggplant chunks and fry on medium heat until tender. 4. Add garlic and parsley. 5. Sprinkle on salt, pepper, and sugar. 6. Cook for 5 minutes, stirring gently. This goes well with all meat dishes and a decent red wine, such as Bordeaux, or a Merlot/Cabernet blend. My friend Denise from Calgary, Canada (met while she visited Bordeaux a few months ago), wrote this email. I tried the ratatouille recipe last week. it was very tasty but I need to do a better job of cutting the ingredients into similar sizes and shapes. I had a glass of the Certain Marzelle (from our day in Saint Emillion) with it. I’m really enjoying this wine.